Yoshiko Jinzenji began quilting after she came upon quilts made by Canadian Mennonites and was deeply moved by their resonant, sacred quality. The richly minimalist quilts she makes today are as powerful as those that originally inspired her. Quilt Artistry, available now in a paperback edition, presents Jinzenji's unforgettable quilt creations in 100 color photos, and 300 black-and-white photos and diagrams. There are also a total of 90 projects for everyone from beginners to the most advanced quilters. Jinzenji is a superb dyer and often makes quilts from fabric or fiber she colors with natural dyes, including very subtle and rich bamboo-dyed white silk. In other quilts she uses antique fabric collected from around the world, and in still others utilizes innovative synthetics such as black metallic cloth created by well-known textile designer Junichi Arai. No matter what the material, her quilts all have a remarkable, quiet power. Like classic North American quilts, Jinzenji's work resonates with a spiritual quality, but one that is rooted in an Asian, even Buddhist, sensibility. 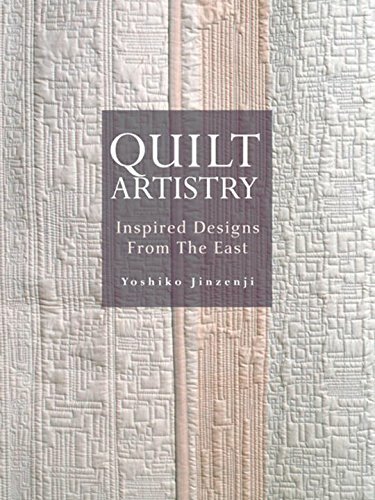 Jinzenji has always wanted to give something back to the Western quilting tradition that first inspired her, and with this book, she is wonderfully successful. In addition to full-size quilts, Jinzenji demonstrates how to make quilted pillows, clutch purses, necklaces, decorative objects, table mats, tiny miniature quilt mandalas, and even a hammock. Detailed patterns and instructions are included for all projects shown. Quilt makers, as well as anyone with an interest in textiles or design, will find Quilt Artistry as inspirational as it is practical. If you have any questions about this product by Brand: Kodansha USA, contact us by completing and submitting the form below. If you are looking for a specif part number, please include it with your message.